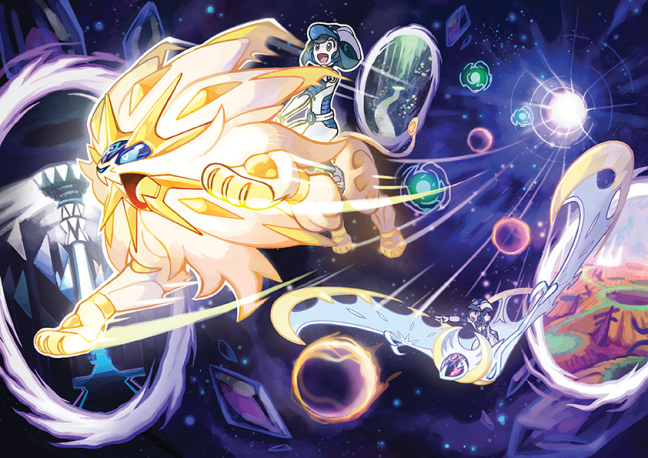 One of the biggest new features for Pokémon Ultra Sun and Moon is the Ultra Warp Ride. In this new mini game you collect rings as you travel through Ultra Space with either Solgaleo or Lunala and avoid balls of energy.  While this is first used within the story, you can go back and use it to encounter legendary Pokémon and Pokémon not from Alola, as well as the Ultra Beasts from the original game. In this guide we will show you how to master intergalactic travel as you explore all the different universes you find. To access the Ultra Ride feature and explore Wormholes, you need to go through a minigame with either Lunala or Solgaleo. The aim is to travel as far as you can before getting sucked into a wormhole – the further you go, the rarer Pokémon you can encounter. The trick is to avoid collisions and keep moving fast – go too slowly and you’ll get sucked in regardless. Orange orbs will give you a speed boost. You’ll see a lot of these at the start, but less the further you go. Blue orbs meanwhile will slow you down. Wormholes come in four types: plain, with a single ring or border around it, two borders, and a purple double border. The more borders, the rarer the Pokémon. They also come in a variety of colours which dictate what Pokémon can be found in them – more on that later. 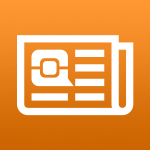 The default controls are motion controls – tilt the 3DS to move around. Motion controls are not so usable for many players however, especially if in a moving vehicle. Luckily you can change the controls to button inputs by talking to an NPC. In Heahea City (Akala Island) head to the Gamefreak office, right of the Pokémon Centre. On the second floor you can talk to the Aether Paradise employee to the left of the entrance to change the controls. Let’s start with the beasts that call these universe their domains, the Ultra Beasts! The Ultra Beasts are powerful Pokémon from other worlds. You will find them in their homes within white wormholes. Some wormholes have no coloured rings around them, but the ones that do will have rarer Ultra Beasts or Pokémon. The more rings the rarer the Pokémon is inside. Most white wormholes without any rings will contain Nihilego, the toxin-filled beast that takes over a host’s mind. The second most common beast you will find is Xurkitree. This wire-like beast is usually found a little further out than Nihilego and doesn’t need a ring around the wormhole to appear. If you go farther into Ultra Space you will see many wormholes with rings. 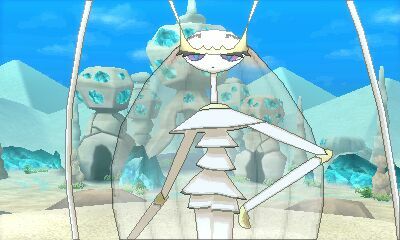 Enter these white wormholes and you can find Pheromosa in Ultra Moon, Buzzwole in Ultra Sun, Celesteela in Ultra Moon, Kartana in Ultra Sun and Guzzlord In both versions if you are lucky. Be sure to show up prepared as everything in the Ultra Wormhole is level 60. In addition to Ultra Beasts, Legendary Pokémon also can be found in wormholes with rings around them. The farther you go the more likely you are to find a powerful and rare legendary! Some will only appear when you have their counterpart Pokémon in your party, while others are version exclusive. There are also twenty regular (non-Legendary) Pokémon available from Ultra Wormholes which cannot be found in Alola. Here is a list of all available Pokémon and their wormholes. Legendaries which require Pokémon to be in your party have those listed in brackets. It’s as surprised as you are. Serebii. The non-Legendary Pokémon have much higher odds to be Shiny! The probability has been recently discovered and depends on the type of Wormhole you enter and the further you travel through Ultra Space. Shiny Pokémon love to hide in wormholes with double rings around them the most, which show up more often after travelling great distances. 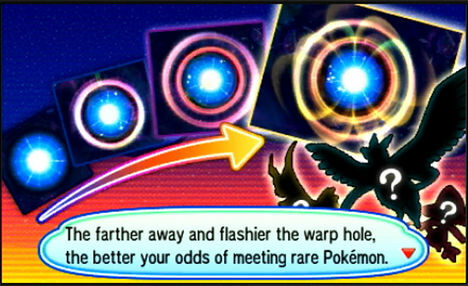 However, Legendaries may need to be caught first to have regular Pokémon show up in these types of Wormholes. If the Pokémon is shiny it will be set when you enter the Wormhole, allowing you to save beforehand and soft-reset for stats and Nature. Legendary Pokémon in Wormholes meanwhile have the usual chance for being Shiny. They are determined to be Shiny on battle encounter, so you can still soft reset for them as normal. 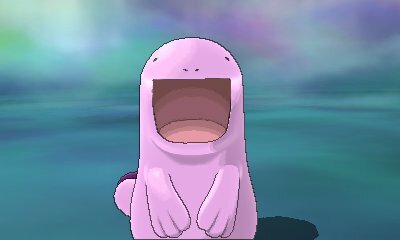 Ultra Beasts can also be Shiny, but still have the same chances as Legendary Pokémon. Below are the formulas for Shiny and Legendary encounter rates. In a nutshell, if you travel 5,000 light years and enter a purple double-ringed Wormhole (after catching all possible Legendaries from there!) you have a 36% chance of encountering a Shiny Pokémon. The less distance you travel, the lower the chance, while a regular double-ringed Wormhole only grants 20% chance. There is no benefit to travelling further than 5,000 light years. Rates for Legendaries and Shiny Pokémon from Wormholes. Try to travel 5,000 light years to maximise your chances! wwwwwwzx. Have you tried out the Ultra Warp Ride feature yet? Let us know any other tips you have for Ultra Ride! Previous PostMy 16-year-old Pokémon from Crystal will join me in Ultra SunNext PostBandai Premium Launches New Poké Ball Merchandise Through Silph Co.